Rock and Roll Saturdays still get a lot of hits along the way. So what do I take away from what I am seeing? If I can ever write a blog about an unemployed and naked Randy Quaid robbing a bank in England and getting away on a bicycle, I should get about a gazillion hits! 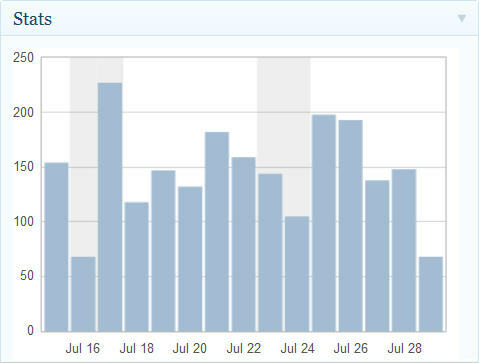 On a side note I am getting a modest amount of daily traffic and I thank you for it. This entry was posted in Blogging and tagged Blog Stats, Cousin Eddie, GE, Naked London Bike Ride, postaday2011, Randy Quaid on July 29, 2011 by Mickey Mills. Thanks for the info and congratulations on your graph. Mine has way fewer hits (that’s okay though). I would feel very uncomfortable if I had more than I could connect with. It’s kind of crazy this blog traffic thing.Occasionally I’ll get a day where I’ll get hundreds dropping by… other days I’m lucky to see 20. You never know. I’ve gotten some good links so it’s building up.. Anyway, thanks for dropping by.